Our diversity is our strength and GW is proud to host over 4,000 students, faculty, and staff from over 130 countries. 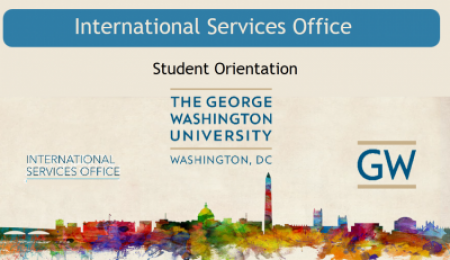 The International Services Office is the first stop for the GW international community and will help eliminate administrative challenges when studying in the US. ISO Advisors host a variety of special events that highlight our diverse international student population. At GW, we are finding new ways to build an inclusive culture! USCIS has released new rules regarding the accrual of unlawful presence in the United States for F and J Visa Holders. Read Thomas LeBlanc's message at GW Today. For more immigration updates, please visit News and Updates. Did you miss the Tax Workshop on March 6th? You can find the tax PowerPoint slides HERE! Welcome to GW and the ISO’s Resources page! The following resources are available to assist you with your transition to the US as well as GW. Jennifer Donaghue, Director of International Services Office, and Omayra Chuquihuara, a GW Senior from the Elliott School of International Affairs, co-hosted a one-hour webinar through the U.S. Department of State's EducationUSA series. In the webinar, "Adapting to American Campus Culture", they discussed topics such as campus life, health care, academic programs, extracurriculars, dining facilities and residence halls, highlighting many of the resources available at GW to prospective students around the word.